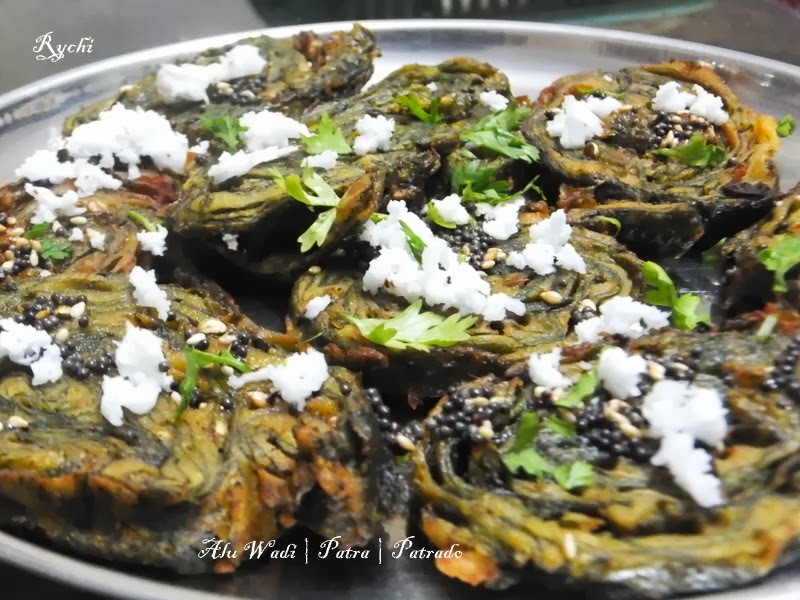 Alu wadi is a traditional Maharashtra cuisine. It is a popular snack prepared during traditional functions. Alu vadi is made from special Colocasia leaves that are mostly available during monsoons. 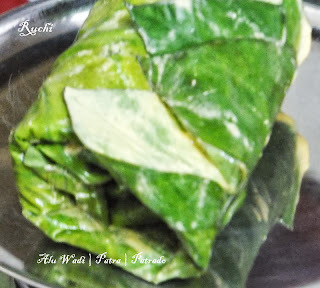 In Hindi it is called "arbi/arvi" and in Marathi "alu"In Tamil we say “chembu elai” these leaves are long and broad and deep green in color. Taro leaf rolls are called "Paatra/Patra" in Gujarati and in Marathi these are called "Alu Wadi/Vadi". Alu wadi is a beautiful, delicious and healthy snack. . It can serve during evening tea. 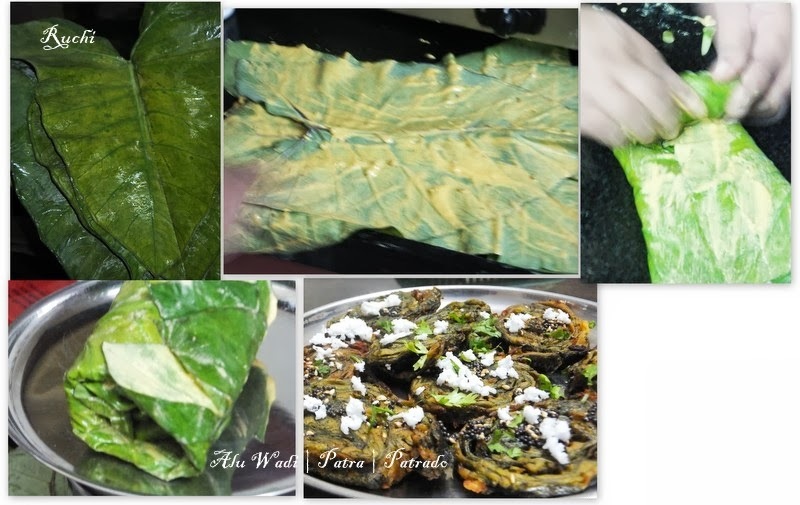 Alu Vadi (patra) is steamed with the aloo or colocasia leaves rolled up one after another after getting smeared with a besan paste. These aloo patras are then cut into small spices and then steamed or deep fried as desired.Last week I saw this big bunch of colocasia leaves in the market and immediately bought it to make aluwadi. In my home everyone loves this snack. Take chickpea flour& rice flour in a mixing bowl. Add red chili powder, crushed coriander-cumin seeds, salt, asafoetida, jaggery, tamarind juice and mix well. 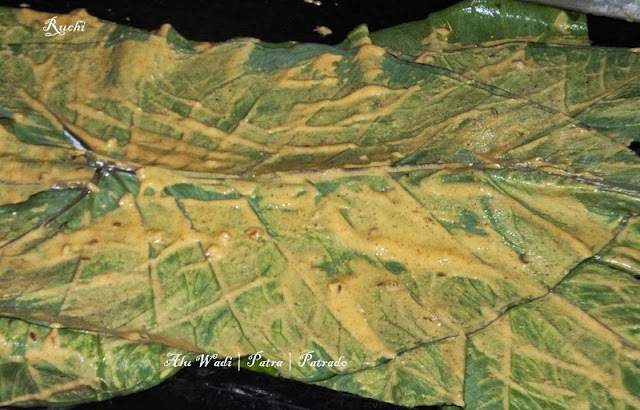 Then, add water as required to make batter of medium consistency The consistency of the batter should be paste like which can be easily spread on the leaves .Adjust spices / seasoning as per your taste. 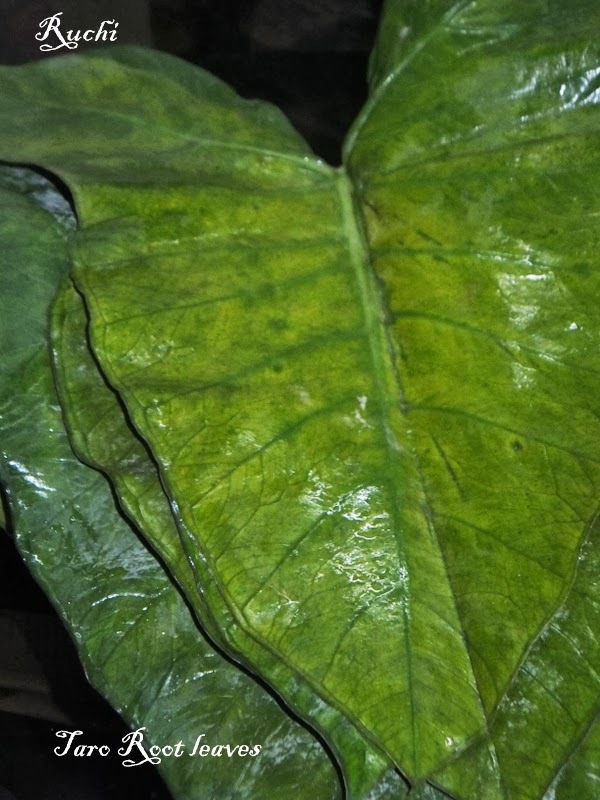 1.Wash and pat dry the Colocasia leaves . 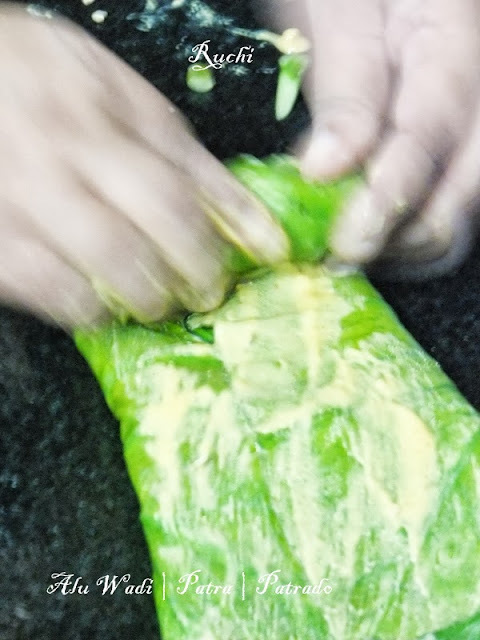 Remove the base stalk from the leaves and Remove a thin layer from the central rib of the leaves to make them more supple Now run a rolling pin over the leaves to evenly flatten the leaves. 2.Now take the largest leaf at the base. Ensure that the dark side of the leaf is kept at the bottom. Place the leaf over a flat surface. 4.Apply the paste over it. Repeat the process for all the three colocasia leaves. 5.Fold the leaves over the sides and roll them as tightly as possible to form a cylindrical log. Place these logs in a pressure cooker and steam them for20 to30 min. 6.After steaming, allow it to cool. Then cut it into 1/2 inch pieces. 1.Heat oil in a pan and deep-fry till they turn medium-brown in colour. Drain the excess oil with tissues and tempered with mustard seeds to it. 2.Once the mustard seeds start spluttering, add asafoetida, cumin seeds, seasme seeds and curry leaves. 3.Pour tempering over it before serving. Garnish it with fresh scrapped coconut and coriander leaves. Never had a chance to eat or to give a try to this alu wadi at home..Fantastic alu wadi Akka.